Pinkeye – a common eye condition also known as conjunctivitis is a highly contagious viral, bacterial and allergic infection of the conjunctiva — the outermost layer of the eye that affects the white part of the eye also called the sclera as well as the inner surface of the eyelid. This nasty eye infection can occur with people of all ages though it is more prevalent especially with young children. You can be sure that it’s pinkeye when the white part of your eye is red and swollen. It usually occurs when allergies are spreading uncontrolled, pollen counts are high and the people’s immune system is weak. This eye infection usually goes away within seven to ten days with no treatments; however, it can be extremely contagious and quite irritating, hence home remedies for pink eye are recommended to get rid of it as soon as possible. Viral pinkeye is caused by a common respiratory virus which is extremely transmittable. It can also be caused by herpes virus as well and can remain up to three weeks leading to chronic conditions. Bacteria cause bacterial pinkeye. It usually occurs when the bacteria get into the eye or around the eye area. This type of pinkeye is also quite contagious and can be caused by some specific diseases or infections such as haemophilus & gonorrhea influenza type B, cat-scratch disease, staph infection, etc. Allergic caused by dust, pollen, etc, the allergic pink eye is not transmittable. However, it can be troublesome because both eyes can be affected. For allergic pink eye home treatment, most people use natural remedies for fast and effective relief. Viral pinkeye symptoms include redness in the white of the eye, thick drainage, itching, swelling & burning feeling of the eyelids, and tearing, etc. There are no medications for some of these virus infections and hence, home remedies come to rescue their treatments. Some commonly occurring symptoms of bacterial pinkeye are redness in the white of the eye, swelling of the upper eyelid, yellow or gray drainage, and mild pain. Antibiotics are usually used to treat these symptoms. Symptoms of the allergic pink eye usually include redness in the white of the eye, burning feeling of the eyelids, mild drainage, stuffiness & runny nose, itching, etc. This type of pink eye is treated with allergic medications. Although prescribed antibiotics and over the counter medications can be used to treat these kinds of infections, there are also various home remedies for pink eye or conjunctivitis and treat the infections naturally. Honey has been used for generations in various home remedies. 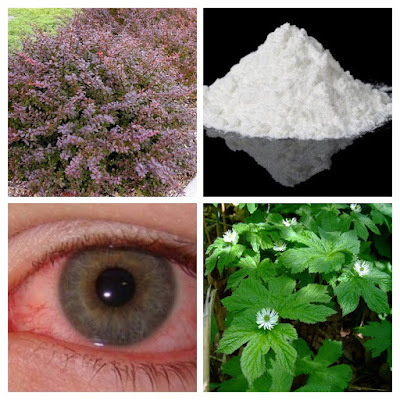 Its antibiotic and antibacterial properties can work wonder in getting relief from pink eye symptoms. To use this home remedy pinkeye treatment, you can make an eyewash solution by add 3 tablespoons of honey in 2 cups of boiled water. As the solution cools down, use it to wash your eyes several times a day. You can also use milk instead of water to make the solution. Green and black teas are often used as natural remedies to treat various conditions. They contain bioflavonoids that can ease inflammation and give extra jolt in fighting bacterial and viral infections. To help soothe pink eye, place a moist tea bag on the affected eye for several minutes, 3 to 4 times a day. Tea can also be used as eyewash; however, using a weak solution is suggested. Barberry also called mountain grape has long been used as natural remedy for a number of treatments. It contains isoquinoline alkaloid, berberine that helps fight viral, bacterial, parasitic and fungal infections. It is well-known to help heal acid reflux, digestive disorders, infections in the urinary tract, etc. It is a perfect solution as one of the home remedies for pink eye. To apply Barberry, you can make a mild solution by adding barberry root bark powder in boiling water. As the solution, cools, use it as an eyewash. Goldenseal is also called yellow puccoon or orangeroot. It is perennial plant and well known for its medicinal use for ages because of its astringent, antimicrobial, and has anti-inflammatory properties. The berberine content in goldenseal can kill bacteria and help heal pinkeye. By mixing 2 teaspoons of goldenseal in a cup of boiled water, you can make a solution to rinse the affected eye. To use as eye drops, make a mixture of 1/8 teaspoon of goldenseal, comfrey, and chamomile with a cup of boiled water. Hydrogen borate is another name for boric acid that belongs to boron family. It is a weak acid and commonly used as an antiseptic for minor cuts and burns and in the treatment of ear infection, acne, etc. Its antibacterial compounds can heal various kinds of infections. So, a mild solution of boric acid mixed with water can be an effective home remedy for conjunctivitis. Probiotics can also be one of the powerful courses of action to heal conjunctivitis. These good and helpful bacteria can kill bad bacteria in the affected area. Common probiotics used as pink eye home remedies are human breast milk, kefir or yoghurt, etc. A few squirts of breast milk into your child’s affected eye can effectively cure conjunctivitis. You can also use goat’s or cow’s milk (unpasteurized) or the liquid part of kefir or yoghurt in case if you are unable to get access to human breast-milk. Just applying a couple of drops in the affected eye can definitely help ease pinkeye. While using the above home remedies for pink eye, you can follow some more preventive measures such as washing your hands frequently, avoiding to touching and rubbing your eyes, etc. Sharing personal hand towels, tissues or washcloths should also be strictly avoided.